One of the most common, traditional building styles is greatly misunderstood. Stucco, a material that is similar to plastering, has become an efficient, durable process that is prevalent in the United States. Because stucco looks similar to adobe, it tends to be most popular in states that are highly-influenced by Spanish and Mexican architecture. This includes Texas, Arizona, New Mexico, California, and Florida. Many people think of stucco as being the poor man’s brick thinking that it is only used by those who cannot afford a better building material. This simply is not true. Some of the most beautiful and luxurious homes and hotels are being built with stucco. It gives an Old World look to the building while also making it cozy. Stucco homes are prevalent in Tuscan-style designs as well as Spanish Mission architecture and some homeowners choose to use it just for one or two rooms rather than an entire structure. If you want a certain feel for your kitchen or basement, stucco can add a definite flair to your room. What do stucco homes look like? When most people think of stucco, they picture a home in the poorer parts of Mexico that has a crumbling look on the walls. 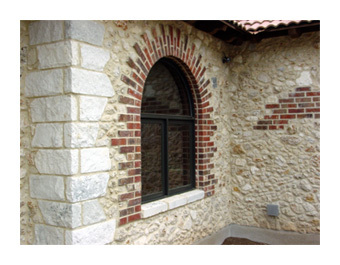 This is considered stucco, but there are many other buildings that use it as well. Stucco can be applied to several architectural styles. It works best with the Tuscan- or Spanish Mission-styled architecture, but doesn’t have to stop there. You may have been to a French restaurant recently where it looked like half of a brick wall had fallen off. 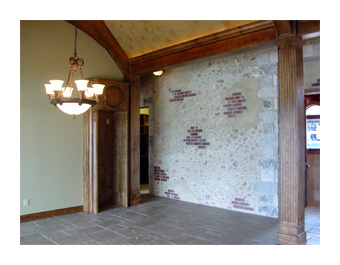 This rustic look that is so popular in restaurants and kitchens is referred to as stucco. Stucco is a three-step process and is applied to a wood or stone structure. If it is a wood structure, then an additional step of applying a lath (a wire mesh) to the wall needs to happen before the stucco so that it has a way to cling to the structure. The first layer applied to the building, called a scratch coat, usually consists of cement and sand. It is applied with a brush. The second layer, called the brown or leveling coat, usually consists of cement, sand and lime. It is leveled and scraped smooth. It needs to dry for 7-10 days before the third coat can be applied. A color coat is colored sand, cement and lime finish that is applied directly to the brown coat. The builder can use a trowel to create various designs or they can spread it smooth. It can have various colors and using coarser or finer sands can change the consistencies. An acrylic finish can be applied in a traditional stucco manner and has a long-lasting quality. It also comes in a variety of colors. Hard coating is the final style of stucco, but it is not recommended. It is very heavy and hard to repair. If you see a home from the 60s or 70s that has glass, rocks, bottles, etc. embedded in the wall, then you are looking a hard coating stucco finish. Stucco buildings have been around far longer than you think. They originated in ancient times with Greek and Roman cultures that created stucco surfaces to paint beautiful frescoes. These surfaces were made by combining gypsum, marble dust and glue. During the Age of Renaissance, stucco techniques were honed by the Italians and spread throughout Europe becoming one of the most common building materials. It wasn’t until the late-1800s that builders and masons stopped using lime-based stucco in lieu of the newly popular Portland cement. This cement made stucco a harder, more durable material. Stucco gained acceptance in the United States in the 19th century and the word was commonly used at this time to describe exterior plastering. When the Spanish Colonial Revival-style building became so popular in the early 20th century, stucco gained a permanent foothold on US architecture and is still highly popular today. Historians believe that there are a couple of reasons why stucco became so popular. Stucco is a fairly inexpensive material. A good artisan could use stucco to emulate fine stonework and patterns. It is a good weather repellant, withstanding bad weather better than many other materials. If you love the look and feel of a Spanish home, then you should consider using stucco to create you next dream home. A new stucco home has many benefits to the homeowner, as well as having an Old World feel, without having antique building materials that are unstable. It truly is a “dream come true” when you walk into your new home for the very first time. For a photo gallery of some great stucco homes in Georgetown, TX, visit the great people at Jeff Watson Homes. Jeff specializes in stucco home building and also Tuscany design.